The five works in the “L’Inesorabile Avanzata” suite were commissioned by the Olivetti Foundation and were published over five consecutive weeks in the supplements of the Italian newspaper, Il Sole 24 Ore. Massacre of the Innocents opens the series with a study of Giotto’s anguished mothers from the Arena Chapel fresco of the New Testament event. This print, and the second and fourth works in the series use an appropriated newspaper format, fragmented to suggest pictures and text columns and interspersed with snippets of imagery. In Newspaper Unread, Kentridge draws his own eye staring out at us, as a witness and chronicler of the events unfolding around him. Cameos of his own gasmask and sextant images, and quotations from Picasso’s weeping women are cropped and scattered throughout the implied blocks of text. 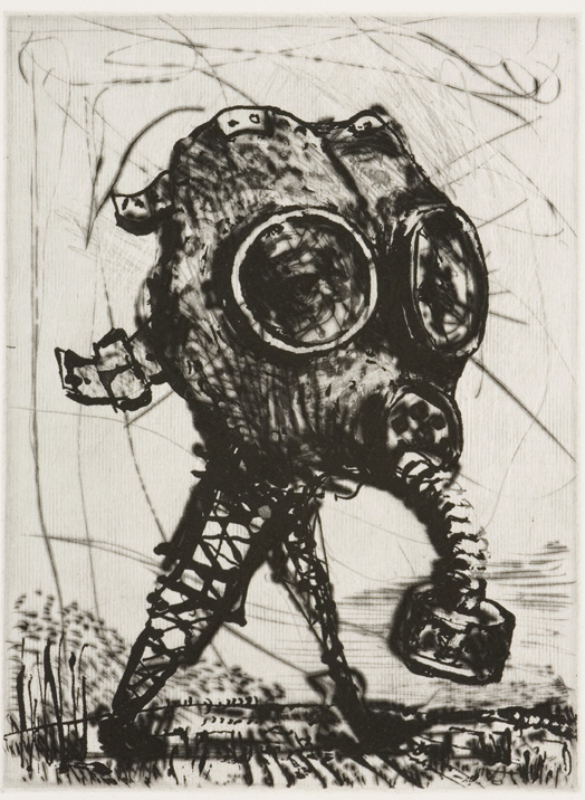 The central work in the series, Mal d’Afrika, is a foreboding augury, a gasmask on pylon legs with a wizened old elephant’s eye gazing desolately from behind his goggles to prick our consciences. Kentridge draws comparisons between the atrocities committed in the Italian Fascist invasion of Ethiopia 1935/1936, the inaction of the League of Nations at the time, and our own observance of the genocide currently taking place in Darfur. 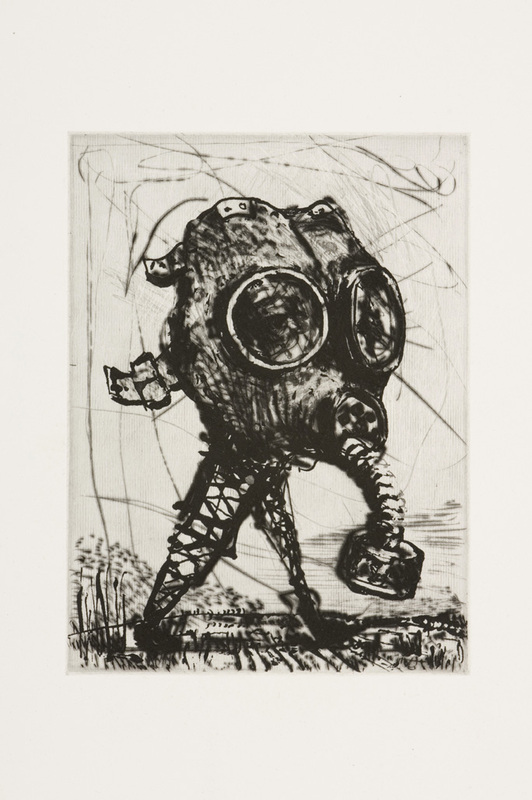 The series closes with The World, a weary metamorphosis of the gasmask into Atlas carrying the weight of the world on his shoulders, a classic Kentridge image of a burdened figure in profile, rickety pylon legs striding across the landscape.